A lot of days throughout the year, we’re just feeling ‘okay’. Not great, not amazing, and definitely not comparing well to all of the art teachers you see on social media. But it’s okay to be just okay. 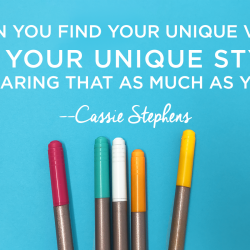 Listen to Cassie’s advice on working through those days, the ways in which you can stay positive, and how you can still provide a positive experience for your kids. Full episode transcript below. Cassie: For my mom’s birthday my brother got the most epic and appropriate mug ever. It says on it, “World’s Okayest Mom.” Okayest is maybe an exaggeration. She’s just a smidge above average. I’m just kidding. She’s amazing, but the mug, of course, was epic and we all had an awesome laugh over it. And it got me thinking, there are many a days when I am quite literally the world’s okayest art teacher. Maybe I am just a smidge above average. I might be lucky some days if I’m even striking average. And it’s on those days when we, because we all have them, we can beat ourselves up. We can take all that negative baggage home with us and let us affect our home life. It could even affect the classes that we see throughout the rest of the day, or even the week, if we let it. Or we can just embrace the fact that some days we are just going to be okay. Not every day is a rainbow going to come out of our rear end and we’re going to have a magical art teacher and experience. Not every day is every student going to be enthusiastic to be there. Some days it’s on us that the lesson was a flop and we were just okay, and sometimes things are just out of our hands. Keep in mind that we have a classroom with not only one personality, the biggest, brightest, shiniest one, that’s us, but we also have 20 to 30, sometimes even more other personalities who are bringing around their baggage for the day, whether that be good, bad, who knows. So let’s, today, talk about embracing the fact that sometimes we really are the world’s most okayest art teacher, and how to flip that around so that we can be just a smidge above that, embrace it and make the most of it. I’m Cassie Stevens and this is the Everyday Okayest Art Room. So I have a couple of suggestions for you when you feel like you are having one of those days, and it might not even be one of those days. One of the most popular podcasts that I’ve ever recorded since starting Everyday Art Room has always been my episode, I think I’ve done two episodes now on burnout. And I always have a lot of people email about that episode, chat with me about that one. I get a lot of messages on Facebook. And what that tells me is, is the reason that burnout, that episode strikes a chord with so many people is because we’ve all been there. And we all have had days where we are just feeling, uh, meh, or okay, okay at best I tell you. And sometimes that can be compounded when we get on social media because we all like to share the beautiful things that are happening in our lives and in our art rooms, and not necessarily what’s behind the curtain. So when we’re having one of those okay days, if you’re like me, you feel even less of an art teacher when you hop on social media and see these people who have rainbows coming out of their behinds. I mean, let’s just be honest. So what do we do about that? How do we make ourself feel comfortable with the fact that we’re just gonna be okay some days, weeks, months, and not allow it to bring us down? So I’ve got four little tips for you today, and hopefully when you find yourself experiencing an okay day or, like I said, sometimes that little okayness can be a cloud that hangs with you for a while, how you can be comfortable with it and get passed it. So tip number is what I’ve already stated. Know that it’s okay to be okay. You know yourself. You know when you are on, and you have all the kids’ attention, and everything is just going great. It’s one of those days when you’re like, “Dang it, where is the admin right now because I could really use an evaluation up in here. I’m turning flips and the kids are living, loving and learning for it.” But you know when you’re just operating not nearly at 100%, and it could be something that affected you at home. It could just be a lack of sleep. If you’re like me, it’s that one time of the month. Sorry, male teachers. When you quite literally should not even be communicating with anybody, let alone small humans, know that it’s okay. But also know that you’re gonna have to work through that. It’s not okay to be short-tempered. It’s not okay to be cranky. You might be feeling those things, but it’s important to know that you’ve gotta work around it. So how do we do that? Thing number one is to stay positive. A couple of tricks that I do when I find myself a little less than enthusiastic about teaching art for day is I kick off every class, and I know I’ve shared this with you before, with a, “Hello, my most amazing artists.” I start every art class with that with all of kids, even when I’m not really feeling it. Sometimes I really wanna ramp it up and jolt myself into getting a little enthusiastic I’ll even greet them outside my door using my microphone to amplify my voice, and then I’ll hold the microphone out to them, so that they can all greet me with, “Hello, my most amazing art teacher.” Then I say to them, “How are you today?” They respond, “Ready to create.” And then I just say, “Okay, then get in here and let’s get started.” That’s how I kick off the class, even if I’m not feeling it, to try to spin it so that I am feeling it and we’re going to have a great and positive day. Sometimes when I’m not feeling it I often think of the lyrics to my all-time favorite song, Accentuate the Positive. If you are not familiar with that song, I might recommend that you give it a listen. In fact, I play it quite a bit in my art room. My favorite … It’s a very old song. My favorite version of the song is sung by Johnny Mercer, so give it a listen. I have the lyrics written down and I absolutely love them. You gotta accentuate the positive, eliminate the negative, and that is all the singing I will do for you because my hands are sweating because I know that was horrifying. But every now and then I just listen to that song, or I read those lyrics and it really does wonders for my mood. So even for you, that song probably isn’t gonna be your jam, but if you get a couple of songs that you know are gonna just be a jolt to your positivity and you’re having one of those days, turn those tunes on and crank it up. I even like to do it during art class, so that everybody can start to get a little bit movin’ and groovin’ and feeling better. Another thing that I like to when my students leave the room is, I like to have them leave on a positive note as well. Let’s be honest, not every class that I have is gonna be behaving super well. Even if I let them know that I’m not pleased with their behaviors, or we’ve had a rough day, or we’re gonna work a little harder next art class on our listening skills, I don’t want them to ever think that I don’t love them, and I don’t love teaching them. I just didn’t love the behavior, perhaps. And I talk to them about that when they’re getting ready to leave, if I’m having one of those days with them. But I always try to end my class with us signing to one another. We all do the sign “I love you” with our hand by sticking out our thumb, our pointer finger and our pinky. And my students, we, as they walk out the door, we just kind of … instead of a fist pump we do a little I love you tap with our hands touching. Sometimes I give a little … as they walk by and that really does let them know that I love them. I love teaching them, regardless of me just being the world’s okayest art teacher. Tip number three would be, fake it ’til you make it. And let me just tell you, those kiddos will not know the difference. And this goes back to staying positive. I feel like, and I’m gonna go back, I’m backtracking to that a bit, a pinch, I feel like a big component, or a big part of stay positive is this, and this I have noticed holds true every single time, when you look for the positive behaviors, the positive things happening in your room, even if it’s just one kiddo who remembered the directions, or a few kids who are remembering to gathering art suppliers or whatever, if you focus on the positive, if you look for it you will find it. 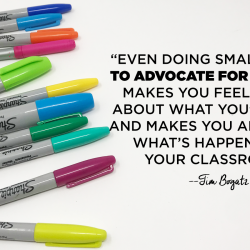 And when you start commenting on it, you’ll notice the other kids start looking for the positive and they start responding to and exhibiting positive behaviors. On the days when I’m a little cranky, we all have those days, and I start nitpicking at my students, “Who left the paper on the floor?” “Why didn’t you remember to get X, Y, Z at the store?” “Don’t forget to write your name on the paper.” “Why is everybody forgetting to write their name on the back of the paper?” When I look for the negative, I find all sorts of negative. So accentuate the positive. Look for the positive. Comment on the positive. And I’ve noticed that that will really spread that warmth around the room and boost my okayest mood to a little bit better of a mood. And like I said, faking until you make, the kids aren’t gonna know the difference. They are going to notice a nasty, negative attitude and they’re not gonna respond well to it. So embracing that positive mindset, looking for the best things that you can find, finding it and letting the kids know about it is what’s going to make your okay mood even better. Number would be, and this is gonna get long, sometimes y’all know, y’all know you’re gonna be phoning it in. You’re sick. You’re not having a great day. Outside factors are affecting, and you just have to phone it in. For me, the other day I knew that I was gonna have an abbreviated art class with my students. There was an assembly and I had planned for them to do this paper mache project that I was very excited about, but at the same time kind of tightly wound about, because it was gonna be pretty stinking stressful. There was a lot of moving parts when I have doubled-up third grade classes doing paper mache. And then on top of that, they were going to be 20 minutes late. So after directions, they were gonna have 30 minutes to just start a project that I wanted them to be able to start and complete in one day. I was getting very flustered and frustrated and irritated, just with the idea and trying to mentally work out the logistics. And I thought, “You know what? No. I am not gonna stress myself out, which is going to stress my students out and it’s going to make for a very unfun experience,” and paper mache should be a flipping blast. So I decided to phone it in a little bit. I got out … And granted, I had a planning time to do this because they were at the assembly. I got out large rolls of bulletin board paper, got out my bingo dauber, drew a whole bunch of fun things on this paper, pirate themed things since that’s our art show theme, and put paint on the tables. When the kids came in I said, “Okay, this is what we were going to do. We’re gonna save the paper mache for next week. We’re gonna have a lot of fun today. We’re going to listen to some piratey music and we’re going to paint this pirate … these pirate-themed banners for the art show. There’s no rules, except for clean your brush in between getting different colors.” And that’s what we did, and we had a blast. I was not stressed. They had a great time painting, and that was a way for me to phone it in and to stay positive, all while being the world’s okayest art teacher. So here’s some other tricks and things that I do when either I’m not feeling great, or I have a limited amount of time or, let’s be honest, I just don’t feel like getting out all of the supplies that day but I still want the kids to have a great time in my room. Thing number one, games. I love to play games with my kids. My students love to play these games, and these are their three favorites. The drawing game, the drawing game is just like Pictionary. And for my … My kindergarten kids love this game especially, and we do this a lot at the end of art class if we happen to have an extra five minutes, not enough time for me to read a book, just enough time for us to play the drawing game. I’ll have a kindergartner come up to the dry-erase board. I’ll whisper in their ear, “Dog,” cat, castle, princess, their teacher’s name, my name, shoe, something very simple, and then they just start drawing it on the dry-erase board. While they’re drawing it, the kids either raise their hand, just like Pictionary, or yell out what they think the artist is drawing. It’s a lot of fun when the student is done drawing whatever it was, like a cat or a dog, I like to spend a moment talking about how each one of us would have drawn that a little bit differently, how they used lines and shapes, which are the elements of art. So you’re still bringing in some educational components while phoning it in just a smidge. My all-time favorite game, and you can hear me talk about this game on a podcast episode, I’ve got a video on my YouTube channel about this game, is a game that we call The Smartest Artist. We kick it off with, “And now it’s time for,” and the kids all say, “The Smartest Artist.” Again, this is a great game if you have a little bit of time at the end of class and you wanna do a little bit of a review. You don’t wanna start a new project. What my kids do when they come up, I pick three students. I have my microphone. I have a host and a hostess, and then I also have a sound effects engineer. Basically, this is just a quiz game. I’ll say, “The first question is for the ladies. Ladies, can you please tell me the primary colors.” The hostess will then call on somebody who has their hand up. And using my microphone, she’ll walk the microphone over and put it up to the student’s mouth so they can say the primary colors. If they get it right, the girls get a point and then it goes over to the boys. The sound effects engineer has one of the favorite … my favorite gadgets in my art room. The kids love it. It’s this thing called a sound machines. It’s a little-bitty gadget that you can find on Amazon, I believe, for like $10, and it just has little buttons all over it that make different sounds. One is a drum roll, and one is an applause, one is a wah-wah when they get it wrong, and that’s what the sound effects engineer presses those buttons while we’re playing the game. My last game is one … You know that I love me some dry-erase boards. This one involves having all the kids grab a dry-erase board, come to the floor and I have a couple of these dice, or di that you can find at the Dollar Tree. They have little dry-erase boards on them, so you can draw all over them. You can put numbers on them, letters on them, even little pictures and shapes, or lines on them. I also have one really large di that I bought at Five Below. I’ll row that di and it’ll maybe say the number three. I’ll roll the dry-erase di that has shapes on it, and it might have circles, and then I’ll roll the other di that maybe has lines and it’ll have squiggles. And I’ll say, “Okay, let’s see how can come up with a drawing that has three circles and six squiggles?” And we’ll just keep playing, and then we can share what each one of us has drawn. It’s a great chat when you wanna talk to the kids about how we all think a little bit differently. We all heard the same directions, but we all came up with something totally different. These are just little things that you can do with the kids, even if you wanted to make an entire art class out of that if you had a day where you just didn’t have time to get out supplies, but you still wanted to give the kids a great experience. Some videos that might be great for you to show, these are my top three, I love Scratch Garden. I’m sure many of you are familiar. They have awesome videos for teaching kids. All of my kids love Scratch Garden videos. Lines, shapes, there’s great ones about color, tint and shades. Of course, the ROYGBIV by They Might Be Giants is an awesome video. And Art Hub for Kids. You could have your kids do an Art Hub for Kids draw-along video. If you don’t have a lot of time, instead of having them draw on paper, and then be like, “Okay, guys, we gotta finish this next time,” sometimes my students will just do Art Hub for Kids on dry-erase boards, and they love it too. Some of my favorite books to read when I need to … just even if I’m having an off-day, but books that the kids always respond to, Mix It Up and Press Here are my students favorite books. Those are the books, especially Mix It Up, as soon I’m done reading Mix It Up the first words out of their mouths are always, “Read it again.” Read it again, that’s how you know you have a winner of a book. Two books that I recently purchased, which I absolutely love, one is called Perfect by Max Amado, and the other one is called The Case of the Missing Chalk Drawings, and that one is by Richard Burn. So having a couple of books that you know the kids are gonna love, that even if you’ve read it to them before, if it’s a read-it-again book then why not read it again? And, of course, some days it just helps to have centers. If you’re gonna feel just meh and you wanna phone it in, here’s my kids’ absolute favorite centers, and they will think that they just had the best art class experience on the plant. My students love origami. Get you one of those easy origami books. Dover Publishing makes great books, period. They make a great easy origami book. I bought that book and I make photocopies, lay those photocopies on the tables, get them some … You don’t even have to buy origami paper. Just get copy paper that you’ve cut into square. They absolutely love it. Their favorite thing to make is the cup, because after they make the cup I let them walk out to the drinking fountain right outside my door, fill it up and use it like an actual cup. They think that is amazing. Blocks, my students love blocks. And all of my early finisher centers, nearly everything has been purchased at the thrift store, so you don’t have to like the bank. They love things from the Dollar Tree, like spirograph. I’ve gotten a lot of those. And even just drawing. One of my students favorite things, my older kids love this, is I took jumbo-sized drawing stick, and I know this is not my original idea, a lot of teachers have done this in the past, and you write silly things on the jumbo-sized drawing sticks, “Design a playground for dinosaurs,” “Draw Ms. Stevens as a monster,” “Draw yourself as a monster,” “Design a playground,” “Draw a castle,” “Draw your fantasy car.” On those jumbo sticks, I write two ideas. One on each side, they’re only allowed to take one stick. If they finish one drawing, then they need to flip the stick over, and flip their paper over, and do another drawing on the back. Regardless of how you’re feeling, if you’re feeling just okay it doesn’t mean that the kids have to have an okay art experience. It also doesn’t mean that you have to hop up in front of the room and turn flips. You don’t. Just you being there in that room giving your best, even if it’s just … you know it’s not your best, but trying your best is going to mean the world to your students. 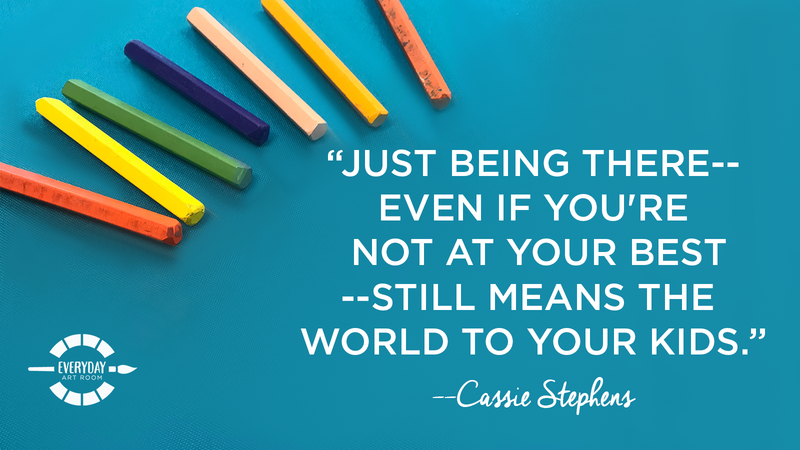 And if that means some days, for your sanity and for their safety, you need to phone it in, then phone it in and embrace it and be okay with it, because there’s one thing you can count on, Cassie might be doing the same thing at that very moment. And it’s okay. Thank you guys for letting me share with you my tips to being the World’s Most Okayest Art Teacher. Tim: Hello, this is Tim Bogatz from Art Ed Radio. As always, thank you for listening to Everyday Art Room. 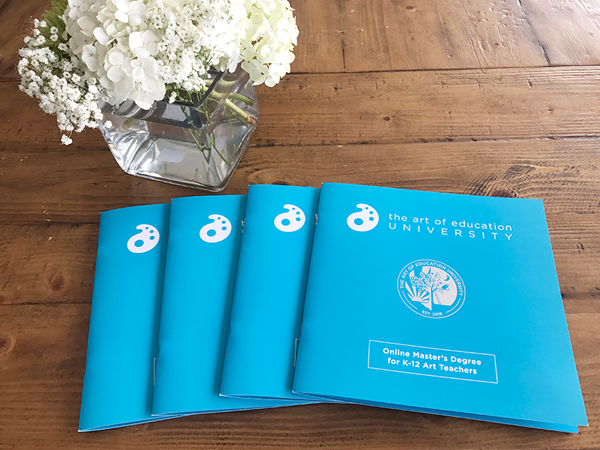 Now, last month we told you about the Art of Education University’s newest course, Studio Photography. If you missed out last month and wanna sign up, there’s a new section starting on April 1st, so you have about a week left to get signed. But in the eight-week studio photography course you’ll learn the basics of photography as you capture moments and create visual stories. You will consider implications for the classroom as you explore best practices and meaningful strategies for approaching photography with your students. You will walk away from the course with a comprehensive portfolio of studio work, alongside practical tools for the classroom. Now, as I said, a new section will be starting on April 1st, so you can make sure you get registered soon. You can look for more details on the courses page at www.TheArtofEducation.edu/courses. Now, let me give this back to Cassie so she can finish up the show. Cassie: And now it’s time to take a little dip into the mailbag. This question came to me on Facebook, and it’s about Artome, Artome art shows. I seem to talk about it all the time. I’ve used Artome art shows in the past. I don’t work for them, so you know you’re getting the real deal when I’m telling you about my experience. I don’t have any reason to not be straight with you. That’s not my speed anyway. But basically, if you’re not familiar, it’s Artome, and the jest of it is, your kids make artwork. You send Artome the artwork. They frame it. They come to your school. They double-mat it, and then they frame it. They come to your school. They set it up like an art show for one night only. Parents can come in and purchase the framed art work. The price is $19 for Artome. Whatever you add to that price is your profit, because it’s a fundraiser. Got it? My suggestion is, pardon my french, hell no. No, you ain’t doing that, uh-uh, do not. That is entirely too much work. And to be honest, I’ve run the numbers a little bit and it’d be pretty difficult to, it’s double matted, to double mat artwork, to frame it, and then be able to put it on display. I would just say, “You know what? I’ve thought about it. That sounds like a tremendous amount of work. I don’t think I’m going to be able to do that, and I instead am simply going to put on an art show, and just do an art show. 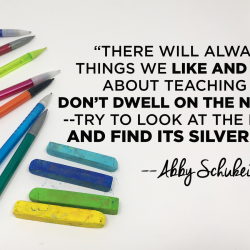 If you’re looking for a way to raise funds, then I would start searching out, because there’s so many ways for art teachers to raises using their student artwork. There’s Artsonia. There’s Art to Remember. There’s Square One Art, and I know I’m even forgetting some. So do you homework on those, and take that to your administrator for next year and just say if you really wanna do a fundraiser. If you’re just wanting to do an art show, then just do an art show. Your students artwork is going to look beautiful whether it’s framed or not. That’s just an added bonus. But you’re looking to do a fundraiser, then do your homework on the big fundraisers that are out there. Present that to your administrator and just see what they think about that. But don’t you dare, not for a minute, consider double-mat framing, then framing, and then putting 600 works of art on display, uh-uh, no. Anyway, let’s go on to the next question. This one comes from Lisa. Lisa says that her … the art teacher will be leaving them at the end of the school year, and they asked if I would answer a question. They’re doing an annual fundraiser, speaking of fundraisers, and this year they want to completely renovate and order innovative art supplies and the best shelving and storage. We’re taking everything out of the present art room and want to start from scratch. Any information you can provide would be great. Wow, a clean slate of an art room. Well, let’s start with the basics. You’re going to need sinks. You need running water. And currently, in my room, my sinks are adult-height, which has always proven to be a little bit of a tricky situation as my kids aren’t adults. So I always have to use step stools, which makes me a little nervous. So if I were you I would think sinks first. Sinks, I would suggest in an ideal world, one sink be adult-height. That when you’re washing supplies, and brushes and whatever you’re not leaning over, because trust me, that hurts your back. So one that’s definitely an adult-height sink. And then maybe one, or two, because I have three sinks in my room, that are child-height. So that’s a definite must. You definitely need to make sure you’ve got the traps underneath the sinks. That is so vital, so that your sinks don’t get stopped up. I would consider your tables. Tables are very important. What kind of height you want, I would strongly recommend not getting stools. All of my art teacher friends who have them absolutely can’t stand stools. My tables that I have are the tables that have been in that room forever, and they’re perfectly fine. But if I were ever to be able to purchase tables I really like the tables that they use in science labs, the really beautiful black-covered surface tables. They look like they clean very easily, so those are … Chairs, and then really nice tables. Now, my chairs I don’t love, so you might wanna do a little bit of homework a throw a couple of those ideas out there as far as to other art teachers, what chairs do you think are the best? Some teachers may really love the stool situation, and I might have just told you the wrong thing. A kiln. If I had an empty room I would definitely request a kiln, depending on the age of your students. I would not recommend potter’s wheels for elementary art rooms. The art teachers that I know that have them, they just … it’s too difficult to teach kids that are under the age of 10 how to … It’s not impossible, but it’s very difficult to do, especially when you have a limited art class time. Now, when it comes to things like technology, I don’t have a Promethean board. I have what’s called a document cam, or an ELMO, and that projects onto my television. And honestly, I wouldn’t have it any other way. I can’t believe I spent the first 15 years of my teaching career just doing everything in an easel. A document cam is a game changer. I can’t speak for the Promethean board, because I don’t have one. Dry erase boards, I feel like, are a must. I love being able to draw on my dry erase board. Storage, storage, storage, storage, especially if there’s not a storage room. Cabinets are the thing that you’ve gotta have. Think about all of the supplies and where you’re going to put it. Some of the storage I have, I don’t really use anymore because technologies taken over. I have this beautiful cabinet with those nice, thin drawers filled with posters. And I just don’t do those … I don’t hang up posters anymore, because we do everything on my document cam, or I create a pressie for my kids to see all the artists that we’re learning about in their artwork. So in short, sinks, tables and chairs, really think those through and really ask other art teachers their preferences. Kiln, definite must. Skip the wheels. Dry erase board, document cam. Those are the things that if I had an empty room, I know I’m forgetting something, that I would really want to have on hand. You know how I feel about rugs. They’re just a giant sponge for collecting germs. Skip the rug. Save your money. Kids can sit on the floor. Mine do, and I have yet to hear them complain. So I hope that helps, and have fun with a great big clean slate of an art room. So can we all totally get T-shirts, or maybe … You know what, here’s what I’m envisioning. Do you remember the Pink Ladies from Grease, and they all had those matching pink shirts with the popped collar? Let’s form The World’s Okayest Art Teacher and Art squad. I’m right there with ya. I’m gonna have my little name embroidered and brazened on the front of mine. Because you know what, it’s okay. It’s okay to be okay. It’s not okay to always be okay, but you know when you’re having those okayest days, and it’s fine. Teaching is kind of like a pendulum, I think. We sometimes swing one way, and we’re … all the stars align. The kids are all in a great mood. You’re in a great mood. They’re listening to you. You’re excited. And then other days the pendulum swings the other way. But a lot of times, that pendulum is hanging in the middle, and that’s the middle ground and it’s fine. So you do you. I think you’re actually way better than okay. In fact, most of us think a lot less of ourselves when we’re actually way more awesome than we can even imagine. So go out there and get it, you okayest art teacher. And have a good one, guys.